Image caption Curry diplomacy in Brussels? It was a simple message from Austria’s foreign minister to Britain’s Brexit secretary. While the UK foreign secretary and international trade secretary have been touting future trade deals further afield, the British diplomatic machine has been on a mission to ensure the Brexit message gets through to the UK’s EU neighbours. The Brexit secretary has spent more time in European capitals than in Brussels, where he has been accused of being underprepared for the two-year process of negotiating the UK’s withdrawal from the EU. This year Mr Davis has touched down in Denmark, Sweden, Finland, Slovakia, all three Baltic states, Spain, Portugal, Hungary, Poland and the Netherlands. He has been to Germany twice, which appears to underline his belief that the Germans will exert serious influence on the final withdrawal agreement. The EU position is that the 27 remaining countries are united behind their chief negotiator Michel Barnier, but I understand some in the British government still believe that member states can be played off against each other. A source from the Department for Exiting the EU denied that Mr Davis was deploying the tactic of “divide and rule”. They described the trips as a chance for the UK to hear other countries’ concerns and for them to receive the oft-repeated message that Britain is leaving the EU but not Europe. The source would not reveal whether Mr Davis had a masterplan for which neighbour to visit, when or in what order. At home, he indulged in petrol-head diplomacy with the European Parliament’s Brexit Co-ordinator Guy Verhofstadt when they attended the same classic car event at Silverstone recently. The two men discovered a shared love of vintage vehicles during a meeting in Brussels last year. “I explained [to] him how to ‘remain’ in the race with a good old British car,” said Mr Verhofstadt in a tweet accompanied by a photo of the Belgian wearing overalls and the minister in slacks. And EU citizens have also heard directly from the Brexit secretary – known as “El Ministro Britanico del Brexit” in Spain or “Ministrul Britanic Pentru Brexit” in Romania. After the government published its paper on the rights of EU nationals living in the UK, Mr Davis explained the policy in editorials for foreign-language newspapers. Each one was crafted for a local audience. Britain’s ambassadors have been deployed to illuminate that issue too, particularly in countries with a big population of British expats or large numbers of citizens in the UK. It led to a slew of videos posted on social media by diplomats more used to working the cocktail party circuit than the camera. A Foreign Office spokeswoman explained that rather than a specific Brexit push it was part of the UK’s strategy to promote its values, which has included sending a British float to Pride in Paris and dispatching the Red Arrows to Croatia and Finland. The UK’s man in Madrid appeared on the Spanish cookery show El Comedista to talk about tortillas and the King of Spain’s state visit to the UK. Food has also been used by Conservative members of the European Parliament to woo their continental colleagues in Brussels, according to the Telegraph. 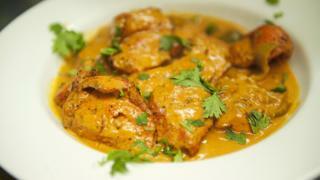 The newspaper reported that they have hosted dinners at the city’s best curry house. Tory MEPs are also planning a foreign media blitz in the autumn, although a spokesman said their aim was to clarify the British position rather than influence the negotiations. But the UK’s overall effort has been criticised as “lacking in strategy” by a minister from an EU country that recently received a British delegation. He spoke of diplomatic initiatives started but not pursued, mixed messages from ministers and a general lack of co-ordination. This week the Environment Secretary Michael Gove met Danish fishermen but it was not all plain sailing, with one of the attendees describing the meeting as “a frank exchange” – diplomatic code for the opposite of a chummy chat. The Visegrad Group of four Central European countries- Poland, the Czech Republic, Slovakia and Hungary – are expecting the Chancellor Philip Hammond to take part in a summit they will stage in September, but I have heard whispers they would prefer Boris Johnson to attend so that they can talk about their future relationship rather than the Brexit financial settlement. In Brussels, officials from member states complain about a lack of briefings from the UK’s equivalent of an embassy to the EU, known as UKREP. An insider added that UK civil servants no longer join their foreign colleagues for drinks or to watch football matches, depriving them of a crucial diplomatic back-channel.